Athlete Hisashi Mizutori, who won a gold medal at the finals of the gymnastics event at the Athens Olympics held in 2004, and who has taken many medals in world championships, was selected to be the Head Coach for the Strengthening of the Men’s Gymnastics Team under the Japan Gymnastics Association after his retirement. He is the youngest in history to be appointed to the position, and led the team to its first team gold in 37 years in the 2015 world championships. In the Rio Olympics held in 2016, Mizutori guided the team to victory for the first time in 12 years since his own participation in the Athens Olympics. He is currently engaged in research on the optimal coaching methods from both the subjective and objective perspectives, aimed at improving the performance of athletes, with a particular focus on gymnastics. My research theme is “apparatus gymnastics coaching.” More specifically, I aim to design a rational and efficient training system for gymnastics competitions. In the world of gymnastics to date, coaching has generally not been carried out based on scientific indicators. In recent years however, gymnastics techniques have become dramatically more difficult than before, and the risk of injury accompanying this trend is also on the rise. Hence, it is becoming increasingly important to conduct scientific analysis on mechanism of techniques. To that end, I am now engaged in “motion analysis of techniques in gymnastics.” This involves gaining a renewed understanding of the “structure of techniques” based on data such as the angle of the joints, center of gravity of the body, and the torque of the joints, from the perspective of biomechanics, and reviewing the methods required for skills acquisition. To link such research to actual improvements in competitive performance, the process of incorporating the research as “methods” that are utilized on the training site is a vital one. Ultimately, my aim is to contribute to improving athletes’ performance through the development of systems that are able to provide feedback to athletes on the training site. In the world of gymnastics competitions, many of the aspects related to the acquisition and improvement of skills, as well as to improving performance for competitions, have been entrusted to the “instincts” of the respective athletes. One of the examples is the “tension” in the wires that support apparatus such as the horizontal bar and rings. For example, in the case of the horizontal bar, the degree to which the bar bends can be changed by adjusting the strength used to pull on the wires. Individual athletes have their own preferences for how far the bar bends, and the subtle changes in the bending of the bar can have a significant impact on how the athlete feels. As the characteristics of the apparatus differ depending on the manufacturer, the ability to make appropriate adjustments to the apparatus to suit one’s own preferences can greatly influence the athlete’s performance. Conventionally, athletes and coaches had relied on their instincts to make adjustments to the tension of the wires. While the apparatus used for regular training are made in Japan, apparatus made by overseas manufacturers are often used in competitions held overseas. This makes it necessary for the athletes to spend time and effort on making the necessary adjustments. In view of this situation, the Japanese Men’s Gymnastics Team, in cooperation with the Japan Sports Agency’s “High Performance Support Project” launched in 2015, developed an “instrument to measure the tension of wires” in collaboration with the University of Tsukuba. This instrument was developed by converting a tensiometer used when setting the sails on a yacht for use in gymnastics. Athletes and coaches have rated this instrument highly, commenting that it is easy to understand the tensile force when it is presented as a number. This tensiometer is now used to enable gymnasts to easily grasp a certain sense of the tensile strength wherever they are. In this way, by introducing a “scientific perspective” into a world that has conventionally relied on experience and instincts, it is possible to improve performance more safely and effectively than before. The Japan Gymnastics Association, where I serve as the Head Coach for the Strengthening of the Men’s Gymnastics Team, is conducting “research on improving the competitive ability of athletes through the verbalization of knowhow.” This involves applying objective parameters to the latent “knowhow” and “instincts” that exist within the subconscious of athletes, and by doing so, creating opportunities for reflecting on techniques and engaging in discussions with instructors to improve the efficiency of training. In gymnastics training, it is typical to record videos of each practice attempt for a competition item, and for the athlete and the coach to check the videos as part of the training session. 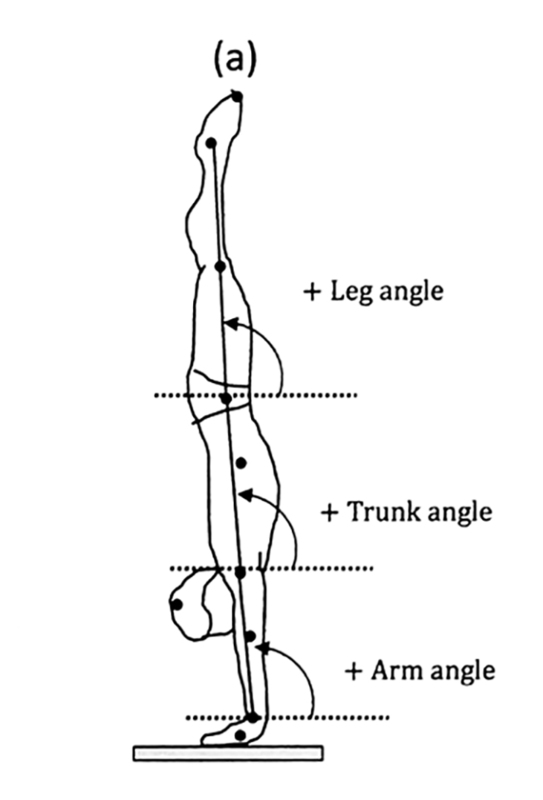 However, as conventional videos made it difficult to conduct accurate checks on elements such as the position of the center of the gravity of the body and the angles of the joints, it was difficult for athletes and coaches to share methods for correcting techniques. In the newly developed system, the athlete’s movements during a competition are recorded with high precision using a 3D laser sensor, then processed through a computer. This makes it possible to visualize and analyze the coordinates of the joint positions. It also enables the verification of aspects that had previously been difficult to identify through regular videos, such as angles and the position of the body’s center of gravity, by presenting the information in the form of numerical data, and makes it possible to conduct an analysis from all directions through 360-degree rotation of the images. If this system could be further evolved such that it is able to conduct quantitative evaluation of performances on the spot, we believe it can dramatically improve the perfection of techniques. The 3D laser sensor emits laser beams 2.3 million times per second to capture the form and movements of human beings three-dimensionally. Based on the 3D data obtained through this method, 3D coordinates are estimated for joint positions, etc. Skeletal structure recognition technology that identifies the curvature of the elbows and knees is also utilized. By extracting numerical data in real-time during a competition, the technology plays a useful role in reviewing points that the athletes can improve on. Unlike conventional motion-capture technology, a feature of this system is that it eliminates the need for the athlete to wear sensors on his or her body, so performance is not affected by the equipment. 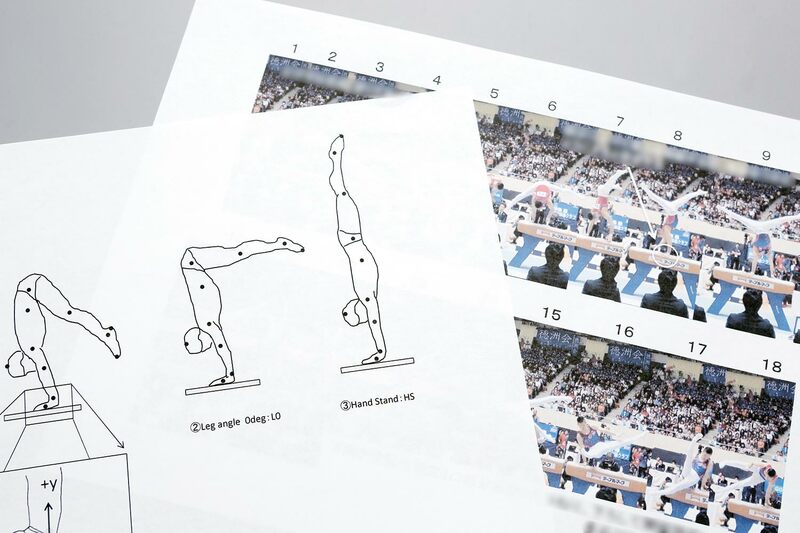 This system, jointly developed by the Japan Gymnastics Association and Fujitsu as well as Fujitsu Labs, is also a useful technology for supporting “scoring” in gymnastics competitions. In gymnastics competitions, much hard work and reforms have been carried out over many years to achieve fair and accurate scoring. However, when it comes to techniques that are becoming increasingly complex and high-speed year after year as a result of remarkable improvements in gymnastics skills, experience and technology are necessary to achieve accurate assessment and scoring through visual judging. This is universal across all sporting events that are scored by judging the performance visually and writing down the score on a sheet, such as figure-skating and synchronized swimming. However, particularly in the case of gymnastics, the rules are also revised once every 4 years, imposing a heavy burden on the judging panel. 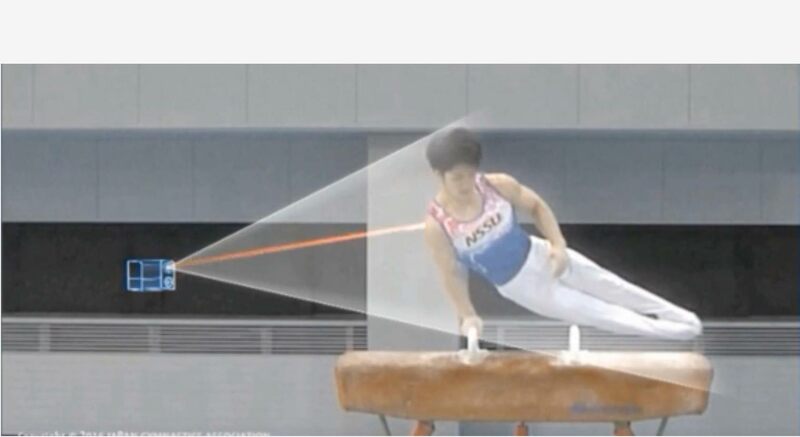 Hence, this joint development project fuses the “3D laser sensor” as well as “skeletal structure/technique recognition technology” developed by Fujitsu Labs, with the “knowhow on technique recognition” that the Japan Gymnastics Association possesses. The aim is to provide support for scoring through 3D laser sensing technology. Of course, in assessing and scoring performances using such systems, it is necessary for the system to first gain an understanding of each and every technique. To that end, the Japan Gymnastics Association is offering its cooperation on registering the techniques used in each competition item in a database. The “database of techniques” is created by having athletes demonstrate the techniques used in each event, and using motion-capture technology to capture the information; even for the pommel horse alone, more than 100 techniques can be used. To enable the utilization of such systems on the sites where we work on strengthening athletes, it is necessary to have in place a process for converting “scientific data” into “expressions of sensations.” This is because athletes experience different physical sensations for the same motion, due to differences in their physique, muscular strength, and flexibility. For example, if you were to ask an athlete about his or her knack in performing a certain technique, an athlete who is skilled at movements requiring flexibility would say, “Twist your leg fully at this timing.” However, an athlete with a small build but strong muscular strength may say that the knack for performing the same technique would be to “Stop moving the legs at this timing.” The responses given for the exact same technique are complete opposites of each other. The right is a photo that breaks down the performance. The left shows a skeletal structure for the same performance. When the athlete performs well, a note is made on the analytical photograph about how the athlete manipulated his or her body during that particular moment, in the athlete’s own words. When the athlete hits a slump, this note can be compared with data on the analysis of the athlete’s current movements in order to review how he or she can revive that good performance. By using the newly developed system, it will be possible to carry out this comparison on the system’s screen. 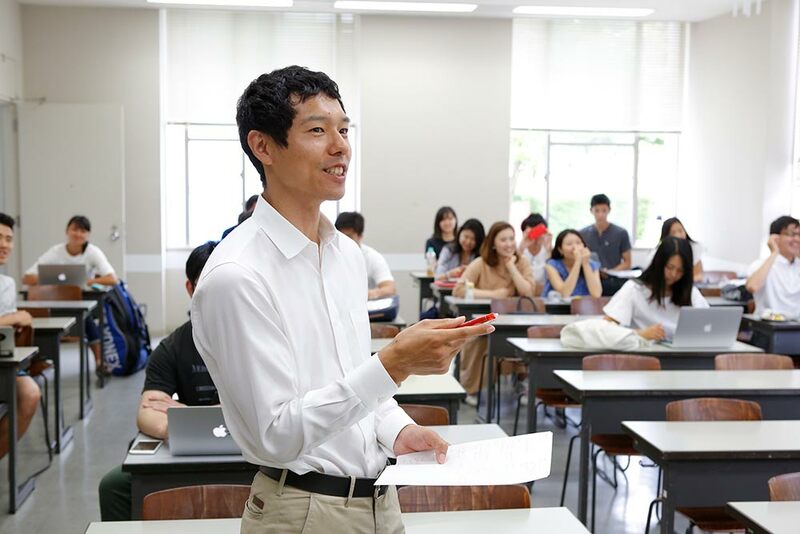 Assistant Professor, Faculty of Policy Management, Keio University. 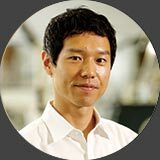 Graduated from the Department of Physical Education, Faculty of Sport Science, Nippon Sport Science University, in 2002. Completed the doctoral program in the Graduate School of Health and Sport Science, in the Field of Study on Sport Education and Coaching, in 2016. Member of the Men’s Gymnastics Team that won the team gold medal in the Athens Olympics in 2004. Specializes in apparatus gymnastics coaching.